Drawing has always intrigued Christie and besides watercolour and acrylic paintings, a substantial part of her work consists of coloured pencil, graphite and pen & ink drawings. Her paintings lean towards an impressionistic / semi-realistic style and show a strong drawing and design element - the result of working as a graphic artist for many years. Christie has had her work exhibited throughout Northern Ontario at many group and solo exhibitions and various galleries. 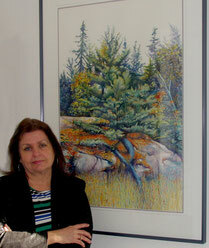 She has completed many commissions and has her work in over 200 private collections throughout Canada and in England. Christie Pearson Anderson was born and raised on a farm on Manitoulin Island and has been drawing and painting most of her life. She has moved around a bit through the years - from Manitoulin Island, to Toronto, Espanola, Elliot Lake, Sudbury, and now is once again back home to Evansville on the Island. Although Christie has always worked full-time she is dedicated to her art, and fortunately she has been able to extend her creativity to her various positions - as typesetter, graphic designer, secretary, and currently as Quality Administrator for Manitoulin Transport. She has also been very active in area artist's organizations and has been an executive and board member of the Northern Ontario Art Association for many years.